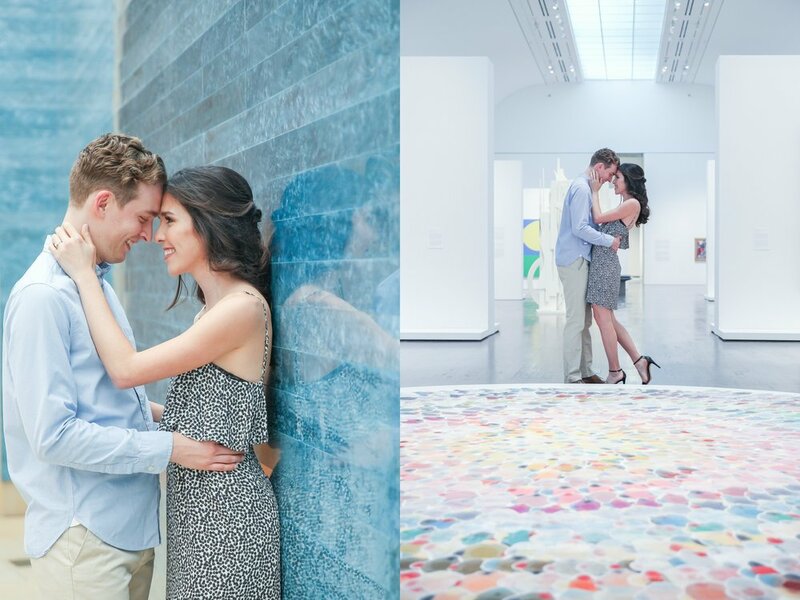 I am so excited to post this amazing Engagement Session with Zach & Noelle! 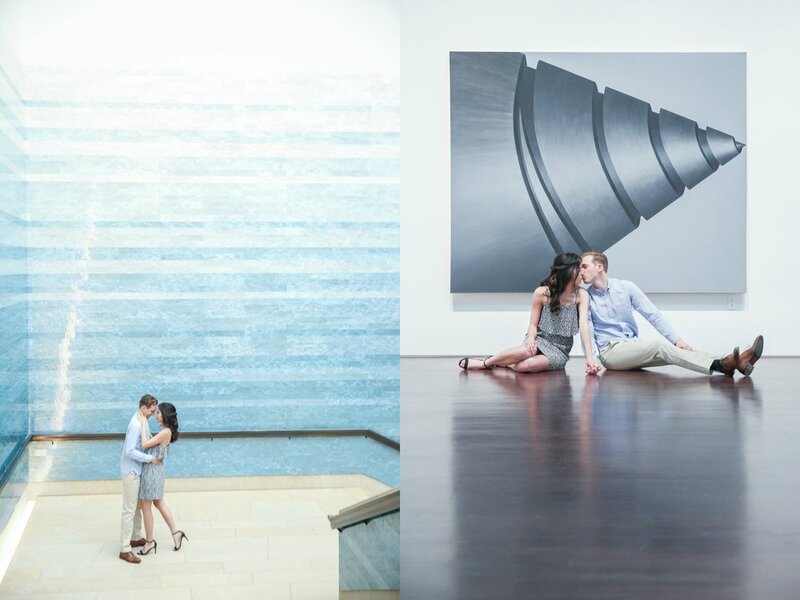 The Blanton Museum is my favorite museum in Austin & is closed on Mondays each week. Well, these two rented it out for part of our session & when they brought the idea up in conversation, I was more than excited! I am in love with the light blue ombre wall that is in the main grand room at the foot of the stairs of the museum-it almost makes you feel like you're standing at the bottom of the ocean in the Caribbean! These two were so fun to hang out with on our session & I loved being able to hear about how their worlds first collided with the help of a little technology & an updated grasp of what dating really looks like in today's day and age. How did y'all meet and what was your first date like? in time - but we count ourselves really lucky to have met our significant other in this way. new faces when people ask "How did you two meet?". decided on a local East-Austin mezcal bar for the first date. "Oh no, it's fine. I really don't mind." "You sure? You should get what you ordered." "I have a confession to tell you…"
"Wait what?! You ate fish on our first -"
"Yah, I don't like fish at all. In fact thinking about eating fish makes me sick." "No way - this whole time?! You could have had those al pastor tacos!" laugh. It's still like that today." Noelle - "Zach and I met on Tinder. I had never been on that or any other dating app before, but my cousin and I were bored one night and decided to see what all the fuss was about. I didn't think anything would come of it but look where we are now. Zach swiped up on my profile (which I later found it is called a "superswipe"), so I guess he meant serious business. After not replying to his (or anyone's) messages, he sent over a gif of a guy at a computer waiting for a response. Over time as the man is waiting for a reply, he turns into a skeleton. Which of course prompted conversation! Our first date was in East Austin at a taco bar (I insisted on tacos, Zach insisted on drinks). We talked for a quite a while and didn't even notice how much time had passed before we decided to call it a night. A funny story that we like to tell people is how the kitchen got my order wrong and gave me fish tacos. I hate fish. But didn't want to seem picky so I "acted cool" and ate a little bit. But it's terrible because Zach loves fish and he was raving about salmon like two months later. That's when I knew I had to 'fess up. Can you describe the Proposal story? with an online ring retailer to find the perfect ring. enjoy my dinner - I want to marry your daughter!" They gave me their blessing and we enjoyed the rest of the night over some cocktails and good food. propose because I was so excited to share it with Noelle. But I waited and I planned. L'Occitane, and the last box had the engagement ring box in it. day to help wrangle people into the living room and to take pictures after dinner. towards the end I took my presents to Noelle and waited patiently with the ring in my pocket. one knee and popped the question "Noelle, will you marry me?" "Wait, really? … Yes, of course!" It's been a whirlwind of planning ever since! These two truly love each other & they shared how much they enjoy reading together, which I thought was amazing. Those who read together, stay together- is that a saying? It should be. I've always been taught to never stop learning & I think that two people who enjoy reading and keeping their minds sharp can only mutually benefit their lifelong commitment towards one another. There is something to be said about this mutual trait they both posses and it is very motivating for me as well to pick up my book currently on my bedside table and cozy up with tea to be brought in to a different world for a moment.  She finds a way to make me laugh. Every. Single. Day. It's for all these reasons and so many more that I decided I wanted Noelle to be my wife." "We've been inseparable ever since, and have loved every minute of it. From going to Book People in downtown Austin, walking around the hike and bike trail, rock climbing, and everything in between, we have become best friends. Zach proposed on Christmas Eve in front of my entire (we're talking 30 people) family, just like Zach's father did many years ago." Zach & Noelle really seem to be such a great match, especially because they enjoy so many of the same things. They explained how excited they were for the Astros winning the World Series and sported their Houston pride. Also, Noelle found her favorite words in her book that said "'Though mayest, Thou mayest!'". I love that Zach honors Noelle for bringing him closer to the Lord. That is one bond we all share & it was very encouraging to read that. 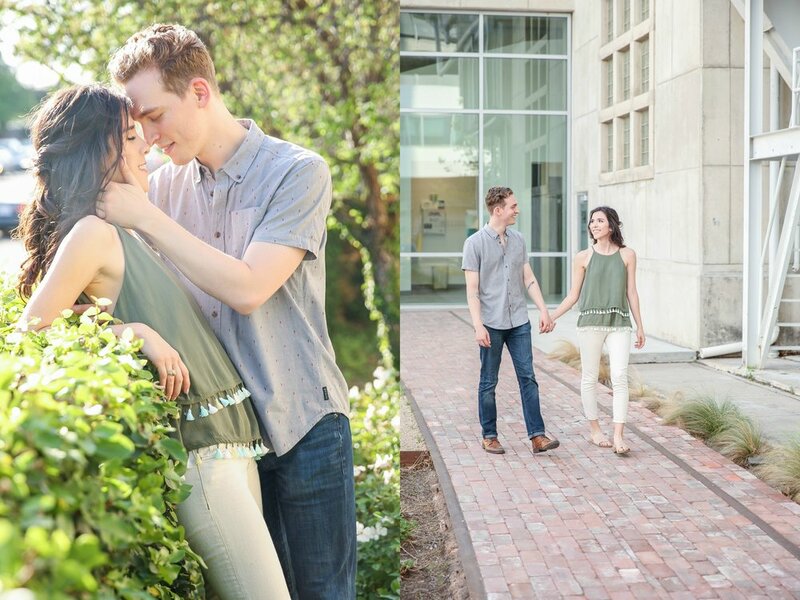 It was such a joy to spend time with these two and I cannot wait for their wedding in January! Cheers, to Zach & Noelle- May your love be strong and may your faith be great.